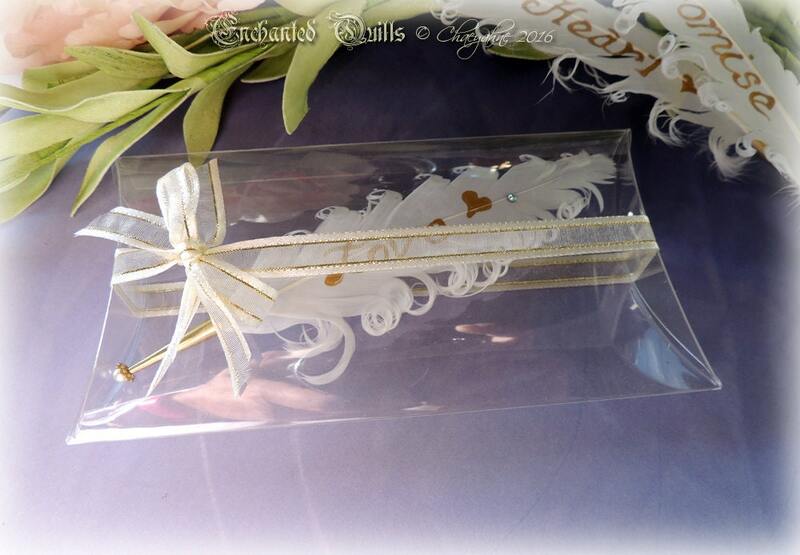 Beautifully Unique, my handcrafted AND painted POSITIVE AFFIRMATION faerie feather favors make a perfectly wonderful, as well as beautiful Thank You Gifting for your guests, for dear friends, or as part of your wedding invitations. Could also be used as inspiration giftings to dear loved ones. The possible wedding & gifting applications are numerous. These are not stamped, not pre-made & imported from China. They are hand crafted and painted, one at a time, here in my little country studio in West Tennessee. 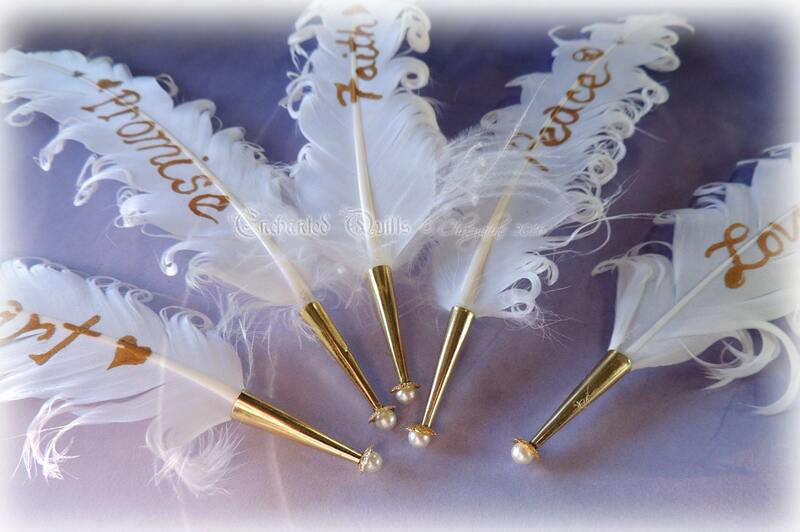 Each feather is hand-painted to your specifications in gold, with gold & pearl accents. They are then bedazzled with lovely crystals down the tiny quills spine. They come to you delicately wrapped in tissue, or with the option to purchase a protective clear pillow box with ribbon wrap. THIS LISTING IS FOR your choice of 1 thru however many, plus the option of packaging! I welcome custom colour combinations. 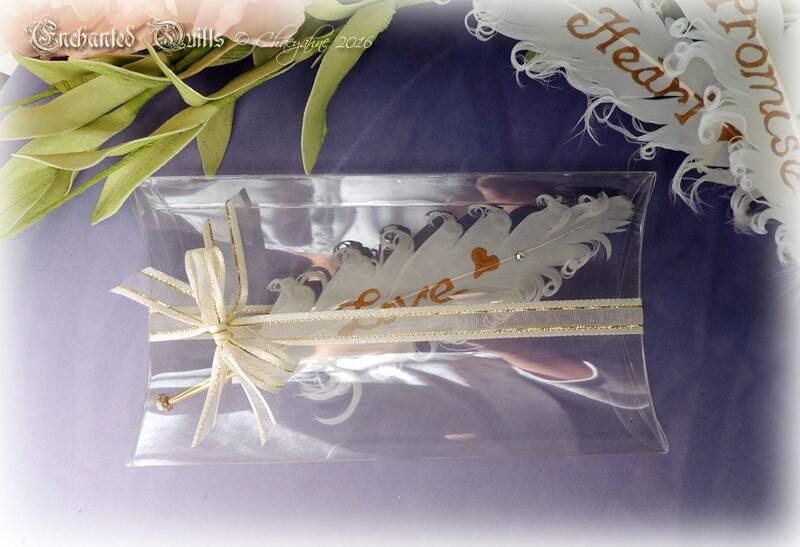 IF you have special wedding colours you wish to commission into your own version of My Wedding Favor Feathers feel free to send me a message & request. 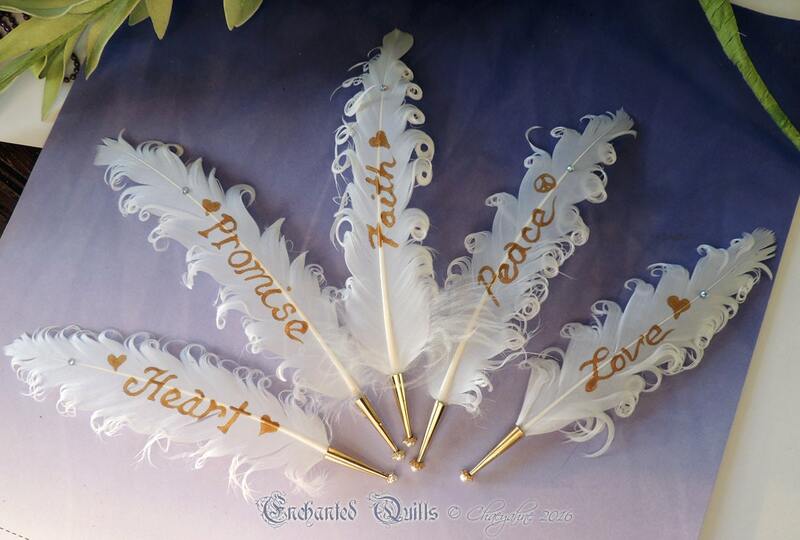 ALL of my quills whether for weddings or otherwise are totally handcrafted with a minuet attention to detail by one person, myself. I wish to always produce for you the most beautiful, well-made, and one-of-a-kind quills in the market today...anywhere...worldwide. It is my love & passion, this work & talent I have been gifted with. There are NO mass productions here in my Studio on the Pond workshop, and quality is always the main focus.